Heather Kusmich was fourth runner up of America’s Next Top Model, Cycle 9. At the beginning of the contest, some of the other contestants made fun of her awkward behavior. Heather has Asperger syndrome and ADHD. But no one was bullying any of the models at the Special Collection 2012, held last March 2, at the UP Ang Bahay ng Alumni — even if all of them has special needs. Our Angel Talkers — Landa A. Bautista, M.A.Ed., curriculum director of The Learning Center, Inc. and the show’s online community manager; and Eleanor Domingo Enriquez, MFLCD, special education teacher, project coordinator, and mother of a young adult with Down's syndrome. Teens with autism and other special needs culminated a four-month long workshop with a spectacular fashion show. It was the most extraordinary catwalk of the year! Thirty-seven unique models sauntered and posed at the “Special Collection 2012” fashion event. Of this group, 10 were persons with autism (PWAs). In 2010, project coordinator Eleanor Domingo Enriquez saw the need to put together the project given the children’s natural propensity for music, rhythm, and movement and the lack of programs for special teens and adults. 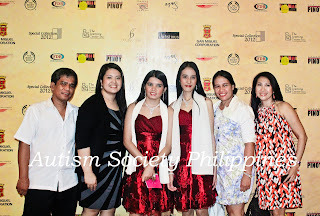 Models were students with varying special needs from eight different schools and centers around Metro Manila namely CDIS Center for Children with Special Needs, Ella M. Castro Educational Foundation Inc., Cradle of Learners, Independent Living Learning Center, Legarda Elementary School, Mandaluyong C.A.R.E.S. Project T.E.A.C.H, Secret of God’s Child, and Philippine Women’s University Post High School Transition Program. They were taught to walk to the beat of the music, pause and turn, execute hand movements, and build rapport with the audience. With moderate to high functioning levels and ages ranging from 12 to 23 years old, participants retained instructions and routines given provisions for demonstration and repetition. The workshop likewise developed turn taking skills, and waiting skills. It also helped develop the PWA participants’ social skills as they were placed in immediate contact with peers, teachers, and audience in a setting that was timed, coordinated and paired with a partner. The end product was increased confidence, self-awareness, socialization, and receptive skills. Weekly workshops, individual home practices, and a general dress rehearsal — complete with lights and sounds — allowed the participants to familiarize themselves with the setting of the workshop’s culminating fashion show. Ultimately, the model participants gave an astounding performance, much to the admiration of a truly amazed audience. The show featured an animal print collection designed by Carl Estrella and Edwin Rosas Visda, a streetwear collection sponsored by Yabang Pinoy, and Agos Pilipinas; a formal wear collection sponsored by Onesimus Suits and Barongs and the finale, Filipiniana collection styled by Eleanor Enriquez and Lorie Cruz. The program also featured an African-inspired dance performance, an interpretative dance in karate by Alcyn Jordan Cuenca, a mini-concert by Thara Marie Santiago and Nica Escasinas of the ASP (Autism Society Philippines) Dream Girls, a raffle draw, a duet by Angelo Dave Ponce, a teen with autism, and his mom Aimee, and the awarding of certificates of completion to all the model participants. This article was first published in the print and on-line versions of the Manila Bulletin. Inspiring. Children with disability CAN do it too.